For the first time in three years, US Quarterly Earnings are Poised to Drop. Third-quarter earnings of Standard & Poor's 500 companies are now expected to fall 0.1 percent from a year ago, a sharp revision from the July 1 forecast of 3.1 percent growth, Thomson Reuters data showed on Thursday. That would be the first decline in earnings since the third quarter of 2009, the data showed. Earnings in the tech sector are now expected to rise only 5.8 percent — less than half the forecast of 13.1 percent growth, according to an estimate at the start of the month, Thomson Reuters data showed. The materials sector is forecast to see an earnings drop of 11.4 percent for the third quarter, worse than the forecast of a 3.3 percent decline at the start of July, Thomson Reuters data showed. Slumping commodity prices and reduced demand from China have hurt that sector. 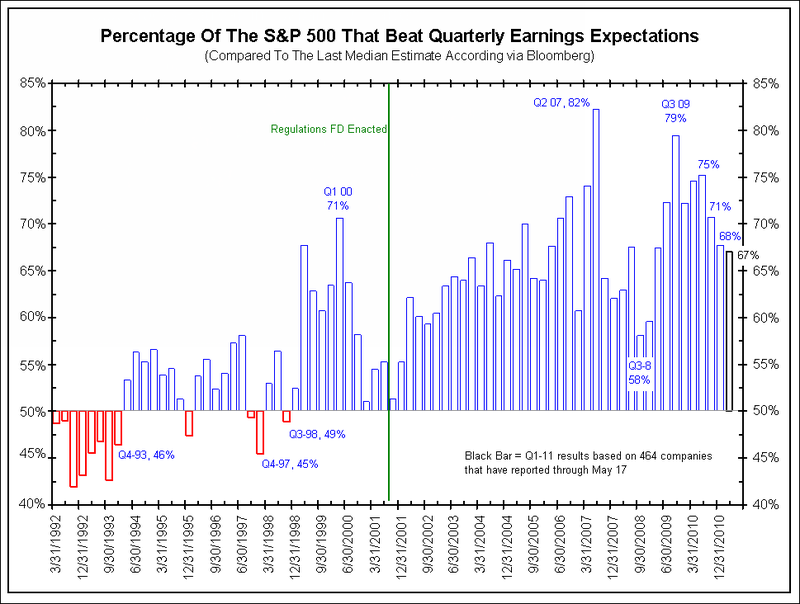 While earnings performance has held up so far for the second quarter — with results in from about half of the S&P 500 companies — revenue has looked much gloomier. Just 41 percent of companies have beaten revenue estimates, the lowest since the first quarter of 2009 and only the fourth time in the past 10 years that the beat rate was under 50 percent. Revenue growth is expected to have increased just 1.2 percent for the second quarter, Thomson Reuters data showed. Don't Worry Companies Will Still "Beat the Street"
In spite of those downgrades, history suggests corporations will still "Beat the Street". Corporations give analysts "tips" regarding profit expectations. Those profit expectations are purposely low. Wall Street analysts lower estimates, if necessary, as the quarter progresses such that corporations can "beat the street". If corporations are going to miss and need an extra penny, they change tax assumption or make other "one time" adjustments as necessary. 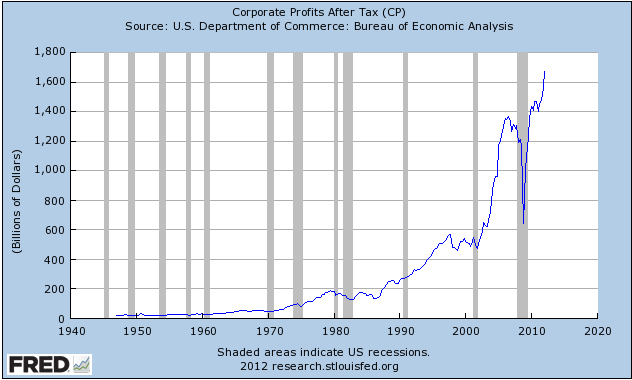 Corporations beat the street by a penny with "pro-forma" (after adjustment) reporting. Percentage of Companies that "Beat the Street"
The last time companies failed to "beat the street" was third quarter of 1998. At the earnings trough in third quarter of 2008, 58% of companies in the S&P 500 still managed to "beat the street". 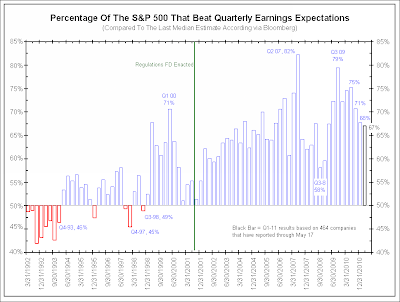 The above chart from Understandings Earnings Estimates by James Bianco on the Big Picture Blog. 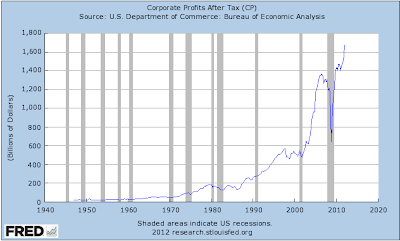 Inquiring minds may be interested in charts of corporate profits. 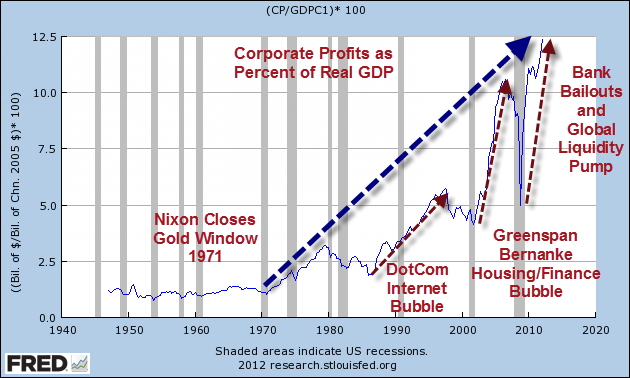 A stunning rise in corporate profits as a percent of GDP started when Nixon closed the gold window, effectively ending the last semblance of the gold standard. In response, the trade deficit soared as did an exodus of manufacturing jobs. 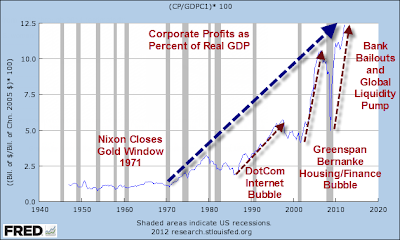 A second massive rise in corporate profits began with the Greenspan Fed-sponsored internet bubble culminating in 2000 with a liquidity push out of misguided fears of a Y2K crash. The third big jump in corporate earnings started in 2001 when the Greenspan Fed (followed by the Bernanke Fed), ignited housing and debt bubbles of epic magnitude. Financial profits soared at the expense of the greater fool going deep in debt buying houses right before the housing bust. In 2009, the Bernanke Fed slashed interest rates across the board, clobbering those on fixed income, to bail out banks. A side-effect was lower interest rates on corporate bonds which also added to corporate profits. Government sponsored repatriation tax holidays along the way also added to corporate profits, as did the Fed paying interest on Excess reserves now sitting at about $1.5 trillion parked at the Fed. Little of this benefited the real economy or produced any lasting jobs. Housing and finance jobs collapsed in the global financial crisis and are not coming back. Nor is another internet boom on the horizon. With each crisis, the shrinking middle class has suffered at the expense of banks and corporations able to export jobs and capital. Small US Corporations not able to get the same tax benefits as GE, Apple, Google, Microsoft, etc., have not benefited from Fed policy. Revise corporate tax policy so as to not give breaks to corporations that export jobs and hold profits overseas. US-based small manufacturers are at a huge disadvantage to corporations like GE that pay negative tax.